TALKING MENUS ARE BREAKING BARRIERS - Taylannas, Inc. The idea for talking menus came from practical experience. In 2006, Susan Perry went to dinner at an Olive Garden with her niece who was suffering vision loss from juvenile macular degeneration. Perry had forgotten her reading glasses, and the two were stuck at a table with no way to read the menu. “It got me thinking,” she says. Thus came Menus That Talk, which is just what it sounds like: menus that read aloud to diners. The menus, housed on a custom-built Android tablet, also speak in various languages, allowing restaurants to break barriers that are caused by both language and disabilities. Perry says the tablets have practical implications for restaurants: Tablet makers report diners will spend more when ordering electronically, unable to resist tempting dessert images or indulging on appetizers. 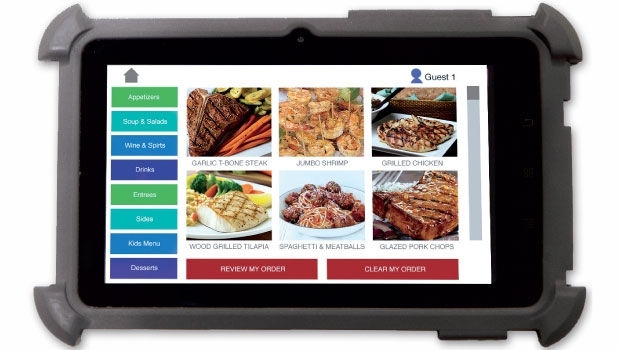 In addition, Menus That Talk tablets, connected to back-of-house POS systems, can also help expedite service and increase efficiency. Even when customers browse the menu in different languages, all orders are delivered to the kitchen in English. The $150 tablets are designed to survive a spill or a drop from the tabletop. Servers can pass the devices out like menus, or they can be attached to the table. Perry says the tablets can be customized with pictures of menu items and be programmed to include games for customers—so even those without language barriers might benefit. Since Menus That Talk rolled out in 2007, restaurants including the Boca Raton, Florida, location of The Original Pancake House and Texas-based The Lion & Rose have begun using the tablets. Menus That Talk is updating its technology, adding the aforementioned capability that will send orders directly to the kitchen, and testing the new system at the 450-bed South Miami Hospital before offering it to restaurants. The hospital’s operations manager, Tom Ferner, says patients and their families are initially surprised by the first-of-its kind technology, but generally impressed with the hospital’s efforts to help the visually impaired. “It takes awhile getting used to it because there’s nothing else like it out there,” he says. Ferner, who has previously worked every restaurant job from busboy to GM, says the tablet has great promise in the foodservice industry. He foresees it becoming a cost-cutting tool, enabling restaurants to save on menu printing and labor costs.